The Pflueger Patriarch is known as being one of the lightest spinning reels you’ll ever come across, but it also sports one of the highest market prices for a Pflueger branded spin reel. 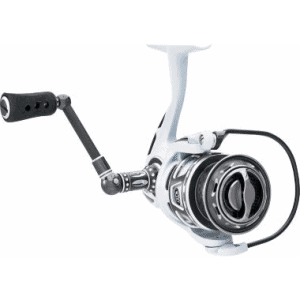 Pflueger is well-known for producing quality products at very affordable price, and that’s why they are usually the most recommended reels in forums or Facebook communities. We had a bad experience with Pflueger President, but that doesn’t diminish Pflueger’s value in our eyes. The price and gimmick (being the fact that it’s the lightest spinning reel around right now) should give you a pretty good idea as to how strong of an item this is. It has it’s up and down’s like any other reel of course, but we’ll get into a little more detail regarding that later. Surprisingly, there are only two versions of the Pflueger Patriarch reel on the market. The main difference is the weight, with the “PATXTSP30X” model it’s got a weight of 6.10 oz, the “PATXTSP35X” has a weight of 7.30 oz. 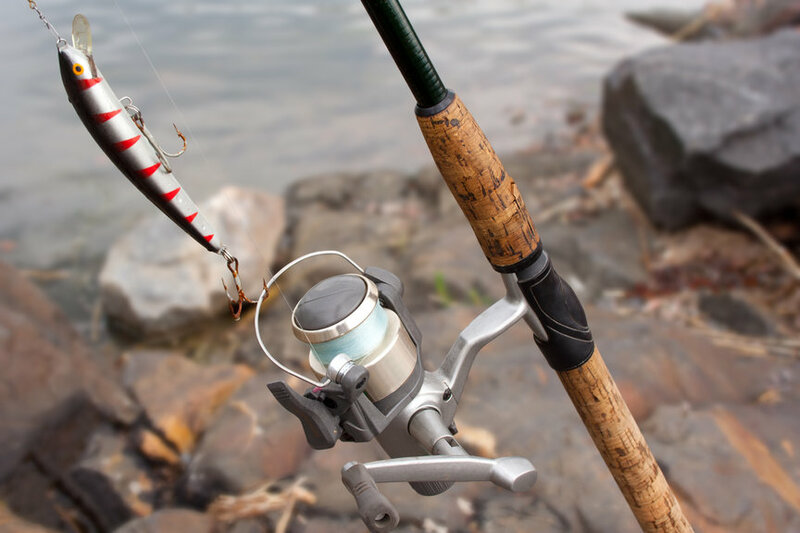 That can be a very big difference because it’s being sold as the lightest spinning reel on the market, but either way both of these reels (regardless of model) are industry leaders in terms of weight to them, compared to their size. The SP30X model has a max drag of 10 lbs, while the SP35X model has a max drag of 14 lbs. They share the same gear ratio, both of them sporting a 5:2:1, and the SP35X beats out the SP30X regarding retrieval rates (27 vs. 28.8). It’s great for both fresh water and salt water fishing, as it can be applied to just about any fishing technique you could imagine (that uses a rod, mind you). 10 Bearing System – A stainless steel sealed bearing system that’s resistant to wear and tear (corrosion). Sealed Carbon Drag – This system is sealed and always lubricated, meaning it’ll run smooth the entire time. Like you can see the Pflueger Patriarch put the most effort in making the reel light, compact and silky smooth. The focus is not so much on power and durability what you would kind a expect from this 3000-3500 sized reel, but on attributes that usually smaller 1000-2500 sized reels have. It`s a bit similar to Shimano CI4+, because it primarily relies on Carbon parts to achieve all that. The neatest thing about this particular reel would have to be the materials that make it up, the materials some of the lightest metals you’ll ever come in contact with. In all honesty I was the kind of person that liked a heavy reel before I found this product, but as soon as I got out on the water a few times with it I knew what I had. The lightweight efficiency of this thing is just amazing, and since it’s the lightest on the market (meaning every other reel that’s being sold is heavier than this particular one) it’s one of a kind. A one of a kind reel is one that you just got to try out, even if you don’t feel that fond of it when everything is said and done. The gears transition easily and you’ll never feel a jerk or pull when you use this reel, it keeps your fishing experience smooth and manageable. It’s durable enough to be used in just about every single freshwater scenario possible, whether you plan on teaching your grandson how to set-up his gear or taking on the largest bass you could find in fresh waters. Carbon plays a major role in how this reel is put together, and since they’re so consistent with incorporating the material it’s done a lot for me (and many others I’m sure as well). Fishing is one of the more fun past times you could choose to get into, you get some alone time and you really get to think about things; but going fishing without the right reel is going to make a difference. Like every reel you’re going to want to push the limits, and there have been cases where this reel didn’t do all that well for me. I’ll admit that I was probably giving it a very hard time, some of the inshore trips I take out on the water result in me getting pretty frisky with the rod. Some of the longer saltwater fishing sessions might put some wear and tear on this reel, and that’s where it’s at risk of breaking prematurely. You want to get as much use out of it as possible, and when it breaks before you’ve gotten to work it in you’re going to be a bit annoyed. It’s expensive as well, and for such an expensive product it seems like they should put it together much better or maybe it`s just a unavoidable side-effect of trying to make it as light as possible. So if you are big on ocean fishing then you better look into Spinfisher or Daiwa Saltist. They have more robust and foolproof built. In conclusion I would have to admit that I’ve fallen in love with this reel, but like anything else in life its got some cons. The Plueger Patriarch spinning reel is absolutely the lightest you’ll ever find, I’ve experienced this first hand and I’ve got to say that it felt pretty amazing. It performs pretty well and is versatile because it’s able to be used at different types of waters. It’s ultimately up to you to decide whether you would like this reel or not, but I would definitely recommend. It’s helped me catch a lot of fish and some durability issues on extended off shore trips doesn’t worry me very much as it seems to be an isolated problem. Try not to wear it out quickly and you’ll be blessed with a spinning real you can grow to love. Getting new pieces of equipment for your fishing set-up isn’t always easy, but in this case it’d probably be a good idea to take a look at the Pflueger Patriarch XT. Boy, what copywriting, ‘the XT 30 has a weight of 6.1 POUNDS! Wow, what a reel! The article has been live for couple of months, but no one has yet noticed this typo. Thanks a bunch for taking time and letting me know! I find it amusing when people who review products review something in the bargain or mid price range and will nit pick the snot out of it. Regardless of the reviews it’s gotten from users. Then they’ll review the newest, best, or most expensive and will lightly brush over what should be glaring deficiencies in something billed as newest, best or most expensive. Case in point is your review of the Pflueger President versus this review. You had nothing but bad things to say about the President despite it’s almost universal praise. Then, with the Patriarch review, you praise how light it is, but at the end mention that you wish it was put together better. For a reel costing $250.00, that seems like a pretty big deal. No one expects the president to be the best thing out there, but some might be expecting that from the Patriarch, especially since you mention several times it’s “one of a kind” status. 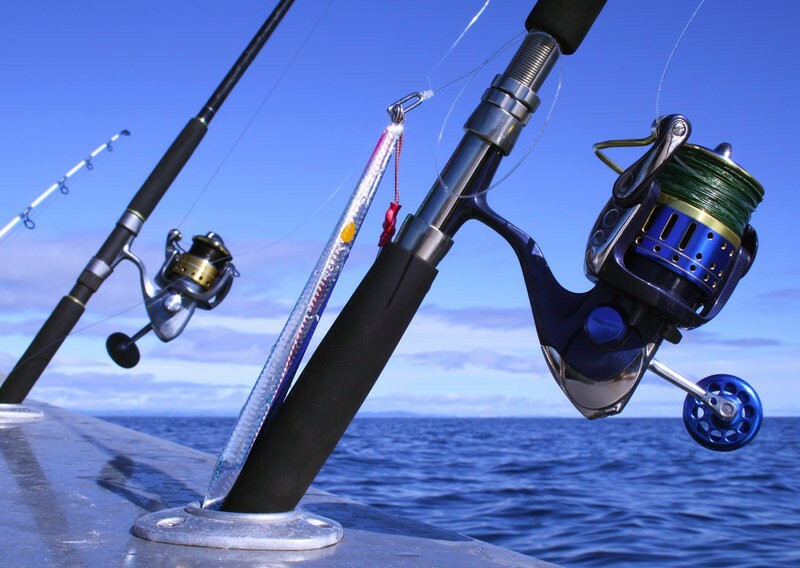 For the average angler, there is almost no reason to need a reel that costly. If you can afford it, more power to you, but you, or anyone else for that matter, shouldn’t be out here trying to convince guys that if all they can afford is $70.00, they’re going to get a piece of junk and they’ll somehow be less of a fisherman. Have a new Patriarch SP30X, used it for the first time yesterday crappie fishing and won’t use this reel any more, it doesn’t have a anti reverse feature which I find very awkward. Means to change the depth just a little you had to adjust the drag to lower your bait and then readjust drag again. Not able to set drag at the same level as before. Was much easier and simpler to back reel. Same situation if you get hung up can’t back reel but go the the fore mentioned operation. I see the photo at the start of your article that the reel has an anti reverse lever. How did that come about? I would like to get rid of this reel and get another Pflueger or Shimano reel with the anti reverse feature. Any recommendations? I own 5 Shimano Stellas, 4 size 1000 and one size 2500. Were you aware that these VERY expensive reels are not supported by Shimano with spare parts, after a very short time? I used to send them in each year to California for service, once past the 5 year old mark I started getting replies from the service folks that parts were no longer available due to the reels age!!! 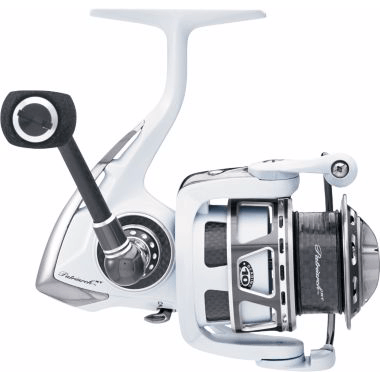 I had a similar experience many years ago with Shimano’s very expensive two speed Beastmaster reels that I was using on my charter boat in Florida and the Bahamas. I mostly fish trout both spin and fly now and live 1/2 of the year in Colorado. I have been using the Pflueger Presidents here now for two years and have no complaints, these reels cost $39=$59 as compared to the Stellas at about $600, you don’t have to be really bright to figure out that I can buy 15 or so of the Pfluegers for the price of one Stella. BTW I fish typically 125-150 days a year so the reels are used, I’d rather use the Pfluegers for a year then give them away to a child or a vet and buy new ones, than spend the big bucks on the whole SHIMANO hype that permeates the industry. Also my favorite inexpensive rods are the Fenwick HMG’s which can be bought for $59-$99 delivered to your door, no tax free shipping if you know where to shop.